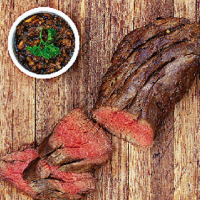 This is a popular safari dish to cook on the braai – the hearty beef and bright, aromatic, Asian flavours are just what’s needed after a long day in the bush. Place the beef in a non-metallic bowl and add all the ingredients that are not going in the relish, turning the beef to ensure the meat is well coated. Cover and marinate in the fridge for 3–4 hours. Remove the beef from the fridge 30 minutes before cooking, so it can come to room temperature. For the relish, place the peanuts, shallot, chillies and garlic in a bowl. Roughly chop the herbs and add to the bowl, then stir in the remaining ingredients. Remove the beef from the marinade, season with salt and cook on a grill rack over hot coals with a light coating of ash. Cook for 15–25 minutes for rare-to-medium beef; turn the meat every 2–3 minutes. Remove from the grill and let the fillet rest under a sheet of foil for 10 minutes. Slice and serve with the herb and peanut relish.